Back to back losses since beating us. I call it "the Murray effect". Belmont is in driver’s seat to win the regular season smh. At least we are in better position for double bye. Which makes both of our losses even more frustrating. Clarification....Belmont is in the Drivers seat for the #1 seed at the Tournament. From what I understand it would be Co-Conference champs for Regular season. Clarification anybody? Yes, you are correct, but I’d say looking at both of our remaining schedules they are in the drivers’ seat for the outright championship as well. Terry Taylor is liable to wear us out like a cheap suit if we don’t “Figger” something out quickly. We have to "figger" something out. We can't let the guy that picked us 4th in conference be right can we? 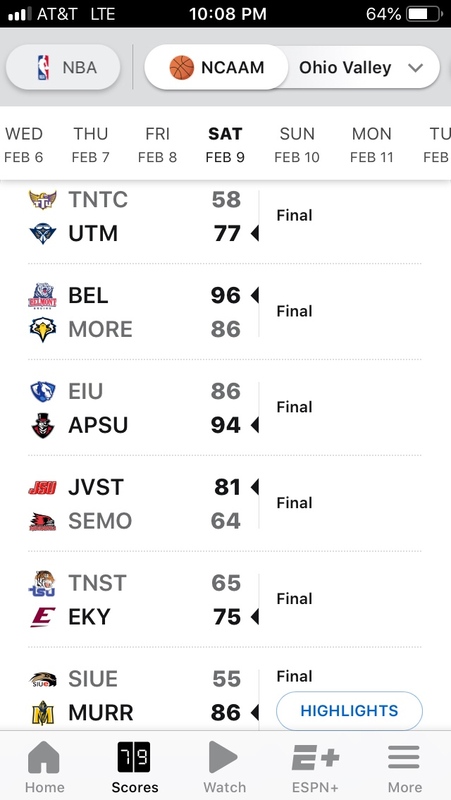 8 of 12 of our OVC teams have losing records in league play and overall. Pretty sad! Somebody should’ve asked Da’Bush about that tonight. Why should she care? Quite frankly, she could be replaced with an orange traffic cone and we'd still get the same results. Hell, they don't even have enough sense to start the women's game three hours before the men's game. The race for the 8th place final conference tourney seed is a doozy. A real head trying to figure out who comes out on top of that mess. 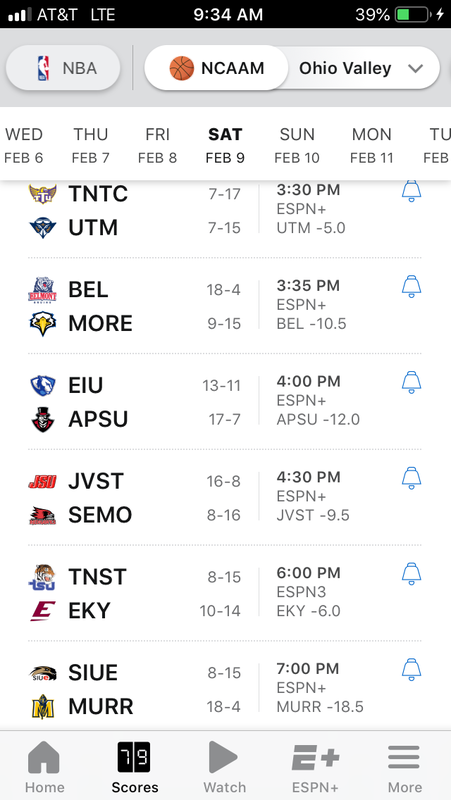 Two of them, Martin and SEMO are hosting Belmont. Any chance their desperation to make the OVC tournament could result in a Belmont upset? I’ve gotta think Martin is the best shot of knocking them off but man Byrd has them really cranking on all 8 right now. 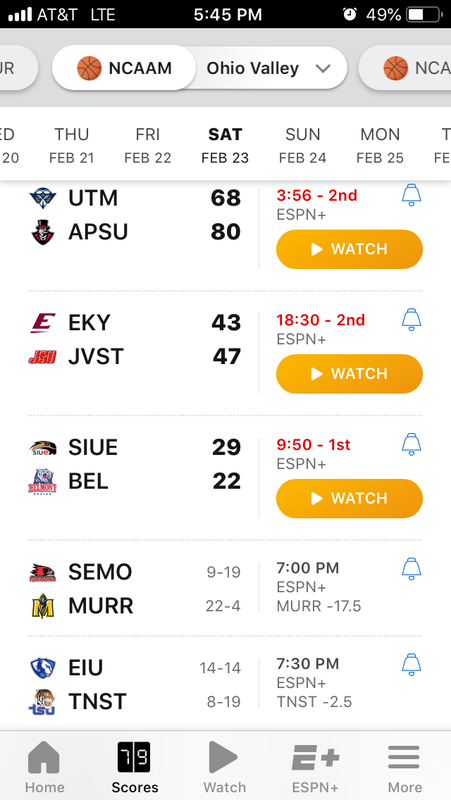 I haven't went back and watched it, but what did SIUe do in the first half to go up 10 on Belmont? It didn't end well, but they must have got off to a great start. The only team with the chance at knocking off Belmont will probably be us in the tournament finals. I actually hope we play them. I want us to beat the best and not have to rely on others to do it for us. I want to know we are capable of beating them. There's a score to settle with JSU also. I’d say there’s a high probability that will end up being the path taken. Looking forwarded to witnessing whether or not the prior losses can be avenged. I think Martin is an underdog next Thursday, but it would not surprise me to see Martin pull off a win. They were just a different team against us this past Thursday and I respect what they can do. The only team with the chance at knocking off Belmont will probably be us in the tournament finals. JSU has beaten them 5 times in a row. I think you gotta give them an outside shot at beating them as well. I wasn't aware of that. Realistically, I only see four teams with a shot. Of course I'm being obvious, because one look at the standings tells that. Should be fun. Follow me on twitter @cmathews82. I just remember the nightmare against Belmont after Ja got the ankle twist. The team looked lost, kinda like Duke looked the other night when Zion had his blowout. Who knows. The top four is up for grabs. Quite frankly, if it's not us, Peay, JSU and Belmont in the semis, I will be flabbergasted.